Fear of REJECTION is a big thing for many sales people. And, it doesn't need to be that way. Before we get into that I'd like to ask you to click on the "Start Here" button below and sign up to receive this newsletter in a new, improved format that is also readable on a mobile. As I mentioned above FEAR of REJECTION plagues many salespeople. Personally, I never had many problems with it. I think that was because my focus was always on helping a customer rather than on how I was feeling myself. 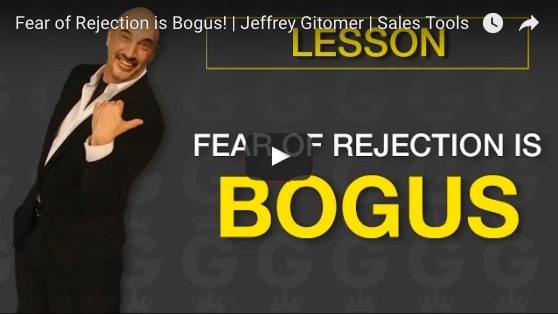 The video below is, noted sales trainer, Jeffrey Gitomer's take on fear of rejection and there is also some comments about an experience I had that also helped me to avoid this fear.